Bacon, one of the main reasons why I can never be a vegetarian. In all seriousness, I have never met a bacon item I haven't liked. 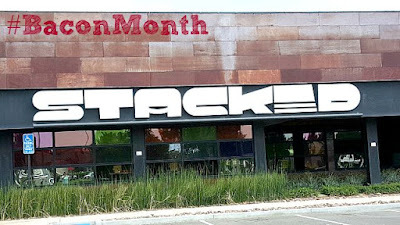 STACKED invited me to their Cerritos location to test out a few new bacon recipes I had never had the pleasure of meeting. Since my husband is also a huge fan, I felt obligated to share with him... okay, it was a date. Did you know that STACKED has a great selection of Craft Beers? Try this Beer Rack and see what your favorite is. 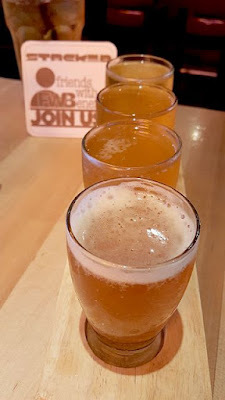 Choose 4 to sample out of 16 beers. I particularly like the Hefeweisen. 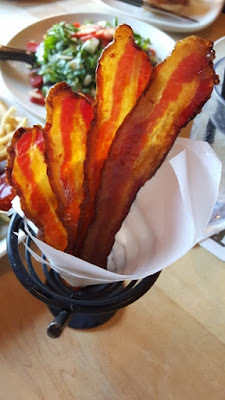 We started off with our favorite, the Candied Bacon. Let it bring you back to dipping your bacon into maple syrup as a kid(and adults). It melts in your mouth with a perfect crispness. I could eat it all day. We all need to eat our vegetables right? 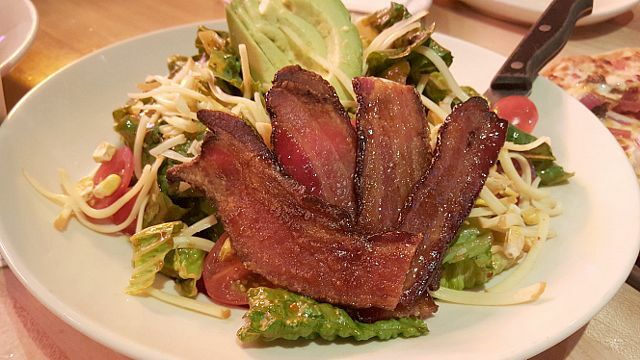 The Southwestern BLT Salad was next with avacado, cheese, corn, tomatoes and candied bacon topped with a spicy chipotle dressing. I would reccomend dressing on the side unless you really like the heat. Want something a little sweeter? 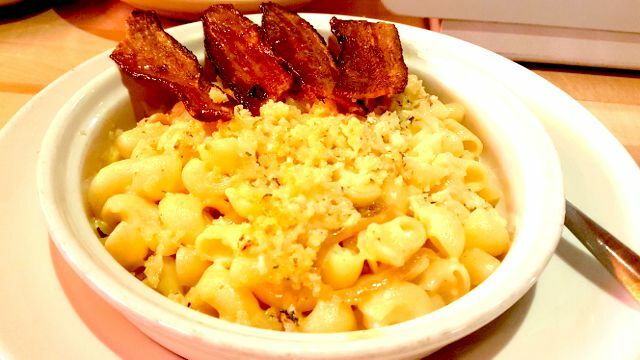 This Sweet Bacon and Onion Mac should hit the spot. Of course, it was topped with the candied bacon. You can't go wrong! My hubby and I split this Bacon Jam Burger. Did you know you can customize everything to your liking? 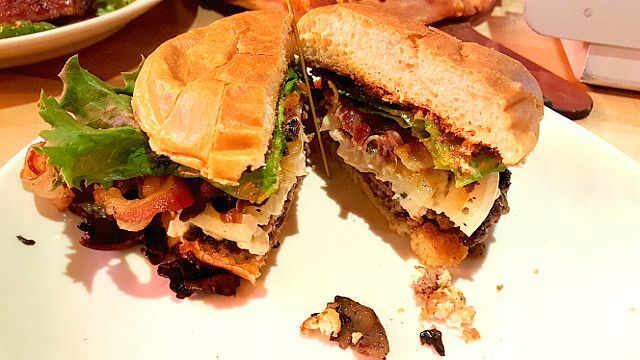 We added mushrooms and onion straws to this bacon filled burger. 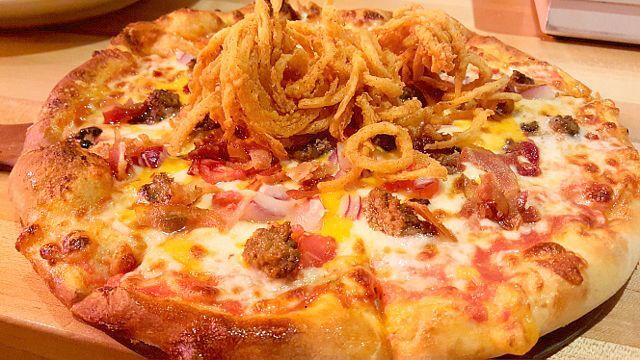 Since we wanted to try all the new items, we ended up taking most of this Bacon Cheeseburger Pizza home for out kids. We did make the addition of onion straws which added a sweet element to this unique pizza that was a big hit with the young-uns. Stuffed doesn't even begin to describe how we felt by this point in our lunch but their was one thing that was teasing us on the menu. 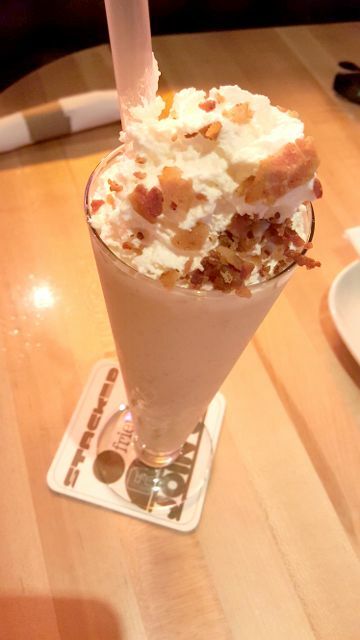 The Cookie Butter Bacon Shake. Yes, you read that right, Bacon. I wasn't so sure about this one... until we tried it. This sweet and salty dessert was an interesting combination which left me wondering if there really wasn't anything that bacon didn't make taste delicious. September is Bacon Month and you don't want to miss it at STACKED. 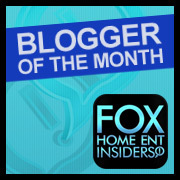 Please visit their website for the closest location, here. DISCLAIMER: I was invited to sample a complimentary meal for the purpose of this meal. All thoughts and ideas are my own. Do not use any photos without permission.